Ananda Samarakoon’s portrait will be ceremoniously uncovered at Ananda Samarakoon studio of Sri Lanka Broadcasting Corporation on January 21 at 5 pm. He would have scored a century had he been among us today. The man whom we have credited as the composer of the Sri Lankan national anthem, Ananda Samarakoon, was not only a talented lyricist but also a skilled artist and singer who turned a new chapter in Sri Lankan history. * Served as music teacher of Mahinda College, Galle from 1938 to 1942. It was in the late 1940s, when Ceylon was about to gain Independence. The government was looking for a national anthem to celebrate the event. A panel was appointed to work on the task. P B Illangasinghe, a panel member, suggested a song. The song was later discovered to be penned by Illangasinghe himself. The panelists were burdened with the responsibility of searching another song in haste. Samarakoon’s lyrics – it started with Namo Namo Matha - lay somewhere waiting to be chosen. 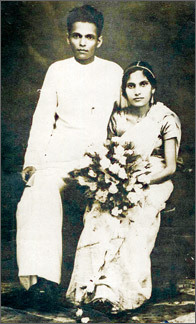 The then government’s Finance Minister, J R Jayewardene, was instrumental in the effort. The trouble, however, did not end. Post-Independence rulers could not last long. D S Senanayake faced an untimely death. The first term of his son Dudley Senanayake as the Premier too collapsed. S W R D Bandaranaike was assassinated even before his term of office ended. In this backdrop pressure groups easily laid the blame on Samarakoon for his lyrics. They opined gana (‘syllables’ give a closer meaning in English) in the first few lines, Namo Namo Matha, of the national anthem are ill-positioned hence more and more tragedies would be in the pipeline. The government was compelled to rearrange the first lines of Samarakoon’s lyrics. Namo Namo Matha followed Sri Lanka Matha and thus how every Sri Lankan begin the chorus at any occasion of national importance. The ode to his motherland took such a toll on Samarakoon. He simply wanted the lyrics to be in one of his books. The song was entered for panel’s attention when the lyricist was in India. That the government would accept his lyrics as the national anthem along with a handsome fee would have been Samarakoon’s last thought. That fee too did not reach Samarakoon as he had already sold copyrights of the lyrics. This and his diminishing family life are said to have driven him to suicide by taking an overdose of sleeping pills on April 5, 1962 at the age of 51. Samarakoon’s stay in Shanti Niketan, though brief, had an impact on his career. He was blessed to meet Tagore in person, which was quite inspiration. 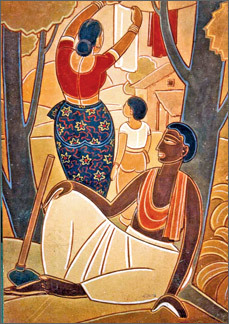 Shanti Niketan sheltered many a Sri Lankan art virtuoso: Sooriyashankar Molligoda, Sunil Santha, Ediriweera Sarachchandra, Wasantha Kumara and Pradeep Ratnayake are a few. At the Niketan Samarakoon realized the lyricist’s role is well beyond mere wordplay to suit some Hindi tune. Flying back from India Samarakoon must have been thinking of how he could change the turn of local music. He wrote his fatal words Namo Namo Matha as the flight was about to touch down his beloved homeland. Dubbed the father of artistic Sinhala music and the founder of the modern Sri Lankan Geetha Sahitya (song literature) Samarakoon apparently drew his inspiration from his guru Tagore. This was the main drive behind his search to create a musical tradition for the Sri Lankan people. In an era in which North Indian Ragadhari music was popular and songs moved were more towards Hindi tunes rather than embodying phrases of literary merit, Samarakoon set out to mould a musical tradition which we could claim as our own. One outcome was Endada Menike which he wrote in 1940. He introduced the means of creating a dialogue within a song when he penned Endada Menike. The song comprises a conversation between a village youth and lass. The lyrics flow beautifully through his composition and soon became a well loved hit among music enthusiasts. A string of evergreen hits followed gaining him popularity. With the Niketan experience Samarakone tried his hand on fusing the songwriting and music into one. He pioneered this role, which is called Vaggeyakaar in India, in local music. He later added his own voice too. That ushered in an era. He influenced the likes of Sunil Santha and Amaradeva. Samarakoon wrote and composed music for many songs including Kellane Nubala of the film Seda Sulang. Podimal Etano, Vilay Malak Pipila, Poson Pohoda, Asay Madura, Sunila Guvanay, Punchi Suda, Nilvala Gangay, Sumano, Pudamu Kusum and Siri Saru Saara Ketay are some of his well known songs. 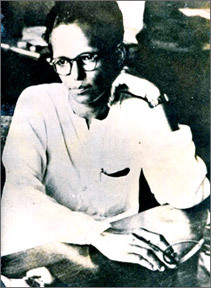 Born in 1911 to a Christian family in Padukka, Egodahage George Wilfred Alwis Samarakoon was one of the first local products of Shanti Niketan. He studied music and painting from Bengali literary genius Rabindranath Tagore and even held some painting exhibitions in India where he displayed coulorful creations highly influenced by Indian art. However his main mission lay elsewhere. The man who created the song dies an early death but his legacy continues, stringed in the words and music of the style he breathed life into many decades back.